Kuretake is owned by the esteemed Mr. Tsumura of Sushi Tsumura…some say the best sushi place in town. I have been there and I have to say, inspite of its sketchy location (which further endears itself to me actually), it is excellent. The sushi is super fresh and is (as the name connotes) what they specialize in. Sit at the bar and you may get a free goodie 🙂 The sushi at Kuretake is a tad more affordable, and it also serves a whole range of Japanese food (of which I have yet to sample). Unagi – Unagi is a freshwater eel and is usually served cooked. It’s got a delicious sticky-sweet glaze on it that complements perfectly its fatty nature (I like almost anything that has got a “fatty nature”). This guy is both sweet and slick…like your favorite ex-boyfriend. Unagi is a true charmer! He is dashing and debonair with the right amount of danger mixed it, but underneath it all, he is a real mushy guy. You may also want to meet his cousin, Anago (Conger eel), who is a saltwater eel, and a little more mild mannered. Negitoro – Negitoro is chopped up Toro (Fatty Tuna Belly) with negi-onions (those little green onions you see peeking out) in a roll. Toro for me is one of the best sushi (or sashimi for purists) you can find, at least in my opinion. Why do I like it so much? Why, for it’s “fatty nature” of course! The fish is incredibly rich and fatty and just sends me! When you dip it in your soy sauce you immediately see little oil spots floating about. Ooooh… Anyhoo, the downside is that Toro is VERY expensive. One of the most expensive sushi/sashimi around. The alternative? The lovely Negitoro! As they only use a little chopped up Toro and mix it with the green onions, it doesn’t cost nearly as much as a full order of Toro sashimi, but still maintains a distinct Toro taste and fattiness, as well as taking on a new flavor of its own with the green onions (which lends a little kick). She is one hot number! If she wasn’t Japanese she would be a belly-dancing-boyfriend stealer! Another less costly alternative to Toro (although more costly than Negitoro) would be Chutoro, which is a medium fatty tuna taken from the upper belly. But if you really want to go all out there is also Otoro, the fattiest tuna, but I haven’t found it here yet (sigh). Ama-ebi – Aaah, my little Ama-ebi, a sweet shrimp usually served raw, and for me, leaps and bounds above the regular Ebi sushi (which is cooked). Its flavor is so delicate with just a tinge of sweetness. I love to just hold it in my mouth and enjoy the moment…which is always over too soon. In Kuretake, they fry the head with salt and serve it to you separately for an equally good, if totally opposite in taste to the Ama-ebi, eating experience. The salty-crunchy head, which is served hot, is the perfect foil for the soft and sweet body, which is served cold. Ama-ebi is like the best friend who always showered you with presents from her kitchen and wore soft pink sweaters with pearls and never cussed in her life. She is the one you will tell your mother you are with when you are really off on a wild fling with Unagi. What I am dying to try however is Odoro-ebi, which is known as “dancing shrimp”, and is Ama-ebi served live! If anyone knows who serves this here, please pass on the information! Hamachi – Another fatty one! I am sure you can see a trend here. 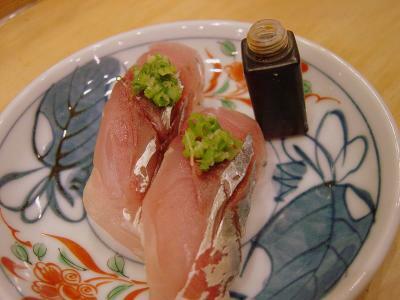 Hamachi is Yellowtail, a migratory game fish similar to tuna. It’s lighter in color and fattier (me and fat…great combination) and is delicious! Hamachi is an old favorite and a regular on my sushi plate. Hamachi is like that friend you made at college who shared all your wild-college-oat-sowing adventures with but who, to this day, remains and important voice in your life. Mamakare – Mamakare is baby sardines marinated in vinegar. Very similar to Saba (Mackarel). As I like a lot of cured fish dishes (kilawin, ceviche, boquerones en vinagre), whether cured in vinigar or citrus juice, I like this one as well. Since it’s been prepared in vinegar, people averse to rawness can happily partake. It’s got a strong flavor stemming from both the type of fish it is and the vinegar its been marinated in. Being a sucker for good-looking stuff as well (we all have our shallow-selves), I like its shiny-silvery skin. Reminds me of my best friends earrings. Mamakare is much like the friend you have (we all have!) that is always so perfectly put together with not a hair out of place. Aji (right above) is Spanish Mackerel or Horse Mackarel and is another favorite. It’s served raw topped with finely chopped green onions. And it comes with it’s own little containment unit of soy sauce. This is so its chopped onion topping does not fall into a bowl of soy sauce whilst dipping. Smart no? This fish has a really good flavor, stronger than your usual Maguro (Tuna). Onions and raw fish seem to go perfectly together, the sharp onion-y taste cutting the fishy-ness of the fish (which I guess is why they pair the raw onions with the raw herring in The Netherlands too). Aji is an absolute metrosexual…much like the guy who brings way more beauty products on an out-of-town trip than most of your girlfriends combined. How is the sushi on that place along Pasay Road? Hi Lori, sometimes I do feel like I know them personally, haha! hi, found your blog through karen’s. just wanted to say “hello” from another sushi fan. Love, love, love Kuretake! A colleague of mine from JICA used to drag me along whenever he felt peckish (which was pretty often) and wanted something other than sencha and senbei. You should also try Zaifu when you’re at the Power Plant; it’s quite good. Hi, got in through Carlos’ blog. You might want to try Hatsuhana Tei. It’s inside Herald Suits along Pasong Tamo (across Makati Cinema Square). 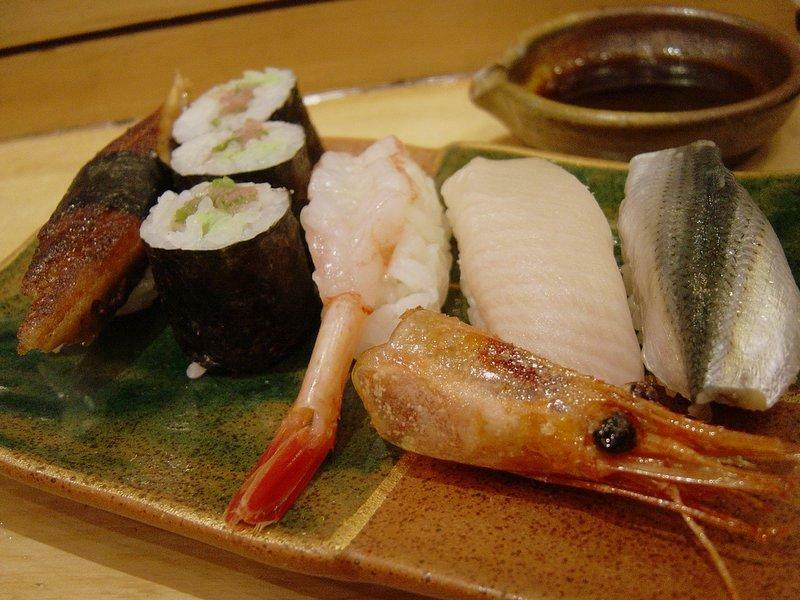 Authentic Japanese dishes and a wide variety of Sushi. Our Japanese visitors love it there! Interesting one. Hey, I’m a sushi addict myself. I particularly like the dynamite rolls and california rolls. We have one here called the bc rolls..hmm..yummy! Hi Ting-aling, the world of sushi is really so vast, especially including the newer creations…and I am intent on trying them all! What’s in the “bc roll”? Sounds intriguing!